Don't worry if emergency communications is not your primary ham radio interest. We've got plenty of other great articles in this month's issue as well, starting with the third and final installment in our Dayton "Safari" series on new goodies found at "the big show" in Ohio. We wrap up with a look at ham station accessories. We also have a rundown of our new contest reporting schedule, which will be phased in over the course of 2013. By the time we're done, most contest results will be published as much as four months earlier than at present. We also have our annual update of all-time records from the CQ World Wide DX Contest (don't forget this year's running - the SSB weekend at the end of October, and the SSB weekend on the fourth weekend in November). 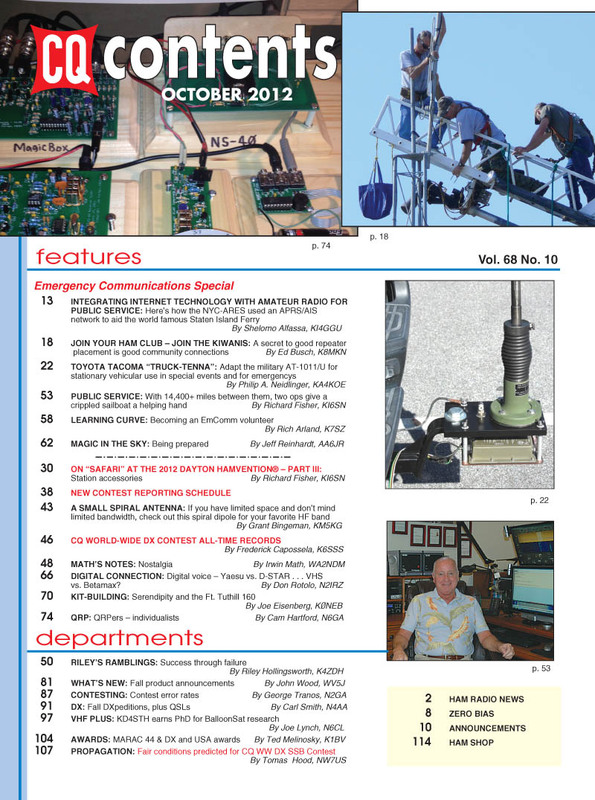 There's always a home in CQ for an antenna article, and this issue features a look at an innovative one, "A Small Spiral Antenna," by Grant Bingeman, KM5KG. Returning to our columns for the month, "Math's Notes" editor Irwin Math, WA2NDM, takes a nostalgic look at his early days in ham radio and at his first radio; and "Riley's Ramblings" editor Riley Hollingsworth, K4ZDH, writes about "Success Through Failure" and the value of making mistakes. "Digital Connection" editor Don Rotolo, N2IRZ, takes an in-depth look at the differences between D-STAR and Yaesu's new C4FM FDMA digital voice protocol (Don't know what all those initials stand for? Read the article!). 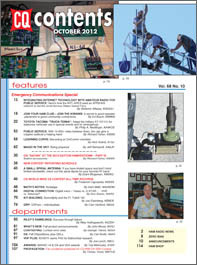 Kit-Building Editor Joe Eisenberg, K0NEB, writes about "Serendipity and the Ft. Tuthill 160" top-band transceiver; QRP Editor Cam Hartford, N6GA, looks at the ways in which some QRPers personalize their low-power projects; and "What's New" editor John Wood, WV5J, checks out the fresh crop of summertime product introductions. Contesting Editor George Tranos, N2GA, digs into contest error rates -- something that's helpful to understand more about as he head into the big-time DX contesting season; DX Editor Carl Smith, N4AA, runs down upcoming DXpeditions and talks about why he thinks traditional QSLing will not be replaced by online confirmations, such as those available through Logbook of the World or eQSL. Wrapping up the issue, "VHF-Plus" editor Joe Lynch, N6CL, offers excerpts from the doctoral dissertation of Paul Verhage, KD4STH, on the effects of high-altitude amateur radio balloon launches on middle and high school students' attitudes toward science; Awards Editor Ted Melinosky, K1BV, reports on the MARAC 44 County Hunters Convention in the Pacific Northwest in July and some "newly discovered" awards you can earn; and Propagation Editor Tomas Hood, NW7US, looks at conditions to expect in October and predicts fair conditions for the CQWW SSB contest weekend on October 27-28. 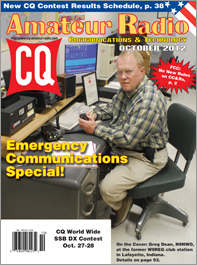 That's a brief look at what's coming up in the October issue of CQ magazine. 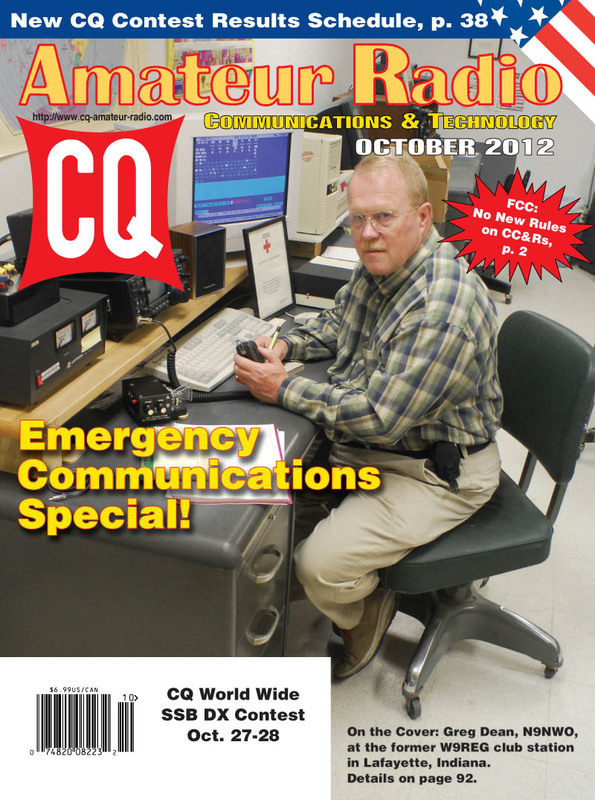 For information on becoming a CQ subscriber, click here. Coming soon: 2013-2014 CQ Calendars! Click here to order your advance copy now! Zero Bias - "A Big, Fat Goose-egg"
On the Cover: Greg Dean, N9NWO, at the former W9REG club station in Lafayette, Indiana. Our "On the Cover" report provides details and an explanation. (Cover photo by Larry Mulvehill, WB2ZPI).